The Roger Dubuis Manufacture in Geneva was founded in 1995. From the outset, the Manufacture Roger Dubuis's ambition was to become a top-level, fully integrated manufacture. After four years of development, in 1999 the first calibres fully designed and developed in-house were unveiled. 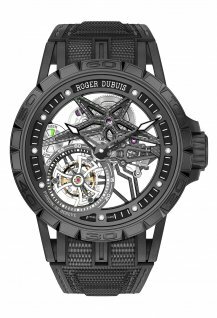 To have resources commensurate with his ambitions, in 2001 Roger Dubuis built his manufacture in Meyrin, on the outskirts of Geneva. This light and airy building in an avant-garde style houses all the watchmaking trades, along with the Manufacture Roger Dubuis's headquarters. 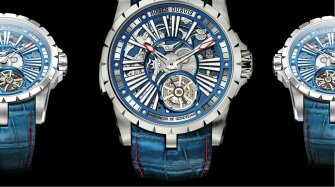 On the strength of its success with true watch connoisseurs, in 2005 Roger Dubuis decided on an extension. In 2008, the Roger Dubuis Manufacture became a part of the Richemont Group. 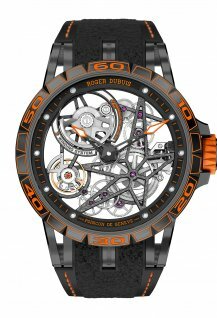 More recently, Roger Dubuis presented two world firsts in 2013 with the RD-101 calibre, the world’s first mechanical calibre with four balance assemblies and five differentials to link them together, which came in the first watch case in the industry to be produced entirely in silicon. 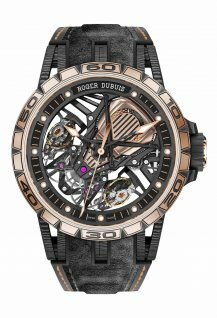 In 2015, the Manufacture Roger Dubuis reaffirmed its strong position in the field of contemporary skeleton watches with the Excalibur Spider Skeleton, which was also presented in a version with the world’s first gem-set rubber bezel. 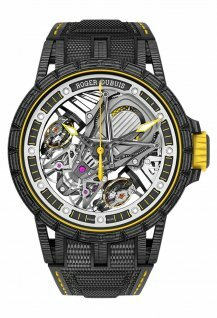 Roger Dubuis brand is founded. Launch of the Excalibur collection, the brand's flagship line, featuring an exclusive double tourbillon movement. Creation of the Quatuor timepiece. 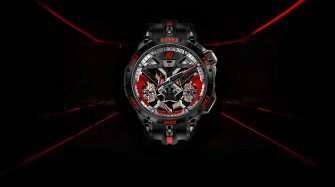 Launch of the Excalibur Spider, a 100% skeleton watch. 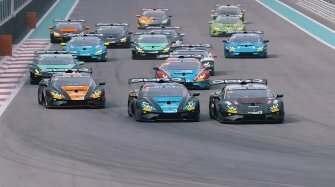 Launch of the Excalibur Pirelli Collection and Lauch of the Excalibur Adventador S in partnership with Lamborghini Squadra Corse. 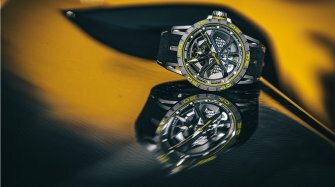 Swiss watch manufacturer Roger Dubuis is governed by an audacious mindset that drives innovation while cultivating profound respect for traditions. 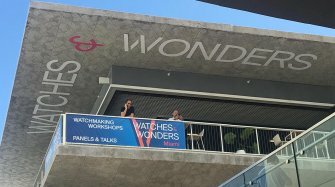 Since its founding in 1995, the company has shown an unswerving commitment to push the technical boundaries of fine watchmaking, incorporating high-end mechanical complications in uncompromising designs. The keynotes of the Excalibur collection are technical excellence and powerful design. In a purposefully extravagant expression of style and watchmaking expertise, this line carries Fine Watchmaking to new horizons. The Velvet watches, divas of Fine Watchmaking, attract everyone's attention with their outstanding charisma. Featuring split-level stylised dials; figures and appliques converging on the centre; decorated clasps; and the part-circle, part-barrel shape of the trompe-l'oeil cases, they are a virtuoso, poetic expression of the brand's codes. 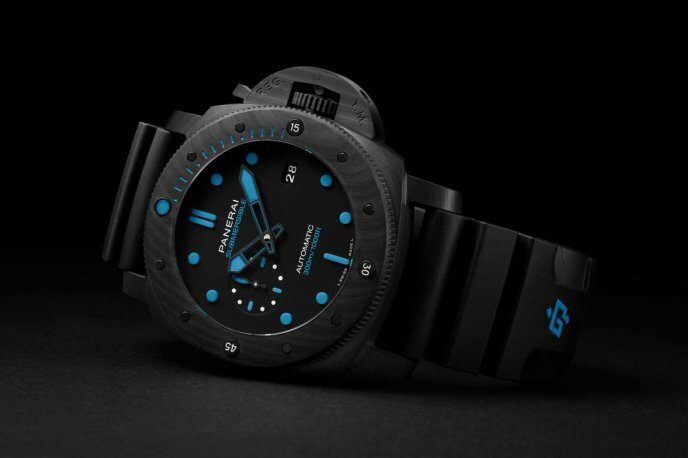 Carbon fibre composites create distinctive watch cases with unique aesthetics – to the delight of brands and customers alike. Roger Dubuis steps away from the macho roar of car engines, and unveils a women’s watch with a delicate floral motif in the colours of the Swiss flag. 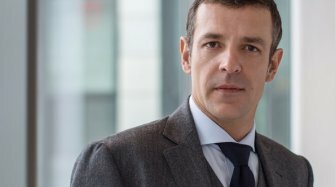 Profile of Roger Dubuis's CEO. 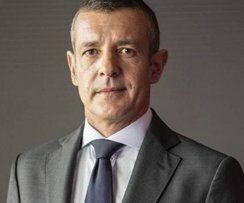 Profile of Roger Dubuis's CEO. 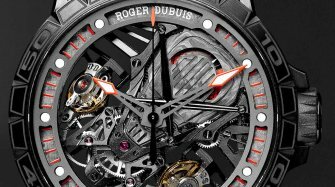 Roger Dubuis has been in the world of Swiss watches for a relatively short period of time, and definitely isn’t one who will follow the crowd. 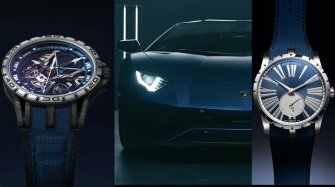 The company itself was only established just over two decades ago, but since then has taken the watch world by storm. When we compare them to other brands they started manufacturing their own movements within a short time period of 4 years. They make a large selection of limited edition watches. 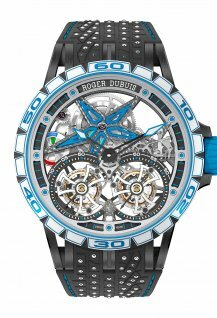 Roger Dubuis as a company feature extraordinary watches that don’t compare to that of many others, and they do it well. 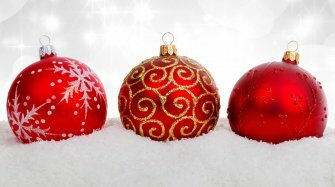 These are the ultimate luxury item for the discerning buyer that do not want to follow the crowd, and for whom price is no object. Past models have included the Sympathie Chronograph and Sympathie Perpetual calendar which featured a more square shaped case. 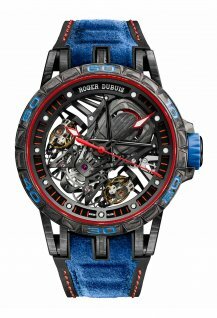 The Excalibur watch lineup in the Roger Dubuis range is truly a unique item when we compare it to others. Mainly a lineup for men, we see models equipped with a single and double flying tourbillon. Watches featuring heavily skeletonized movements and more subtle automatic models. 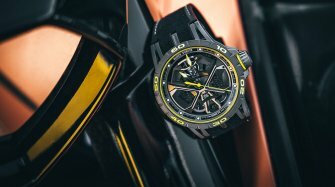 Interesting, Roger Dubuis do not offer a chronograph in this line-up. Models such as the Spider Pirelli feature an incredibly unique black strap. The black strap is no ordinary rubber strap, as the black rubber inlay is from a Pirelli race winning tyre that has competed in real races. A truly unique black strap indeed! Certainly, a watch for those whom status is the ultimate, price is no object and require a piece of outstanding quality. Another watch in the Excalibur lineup that is of considerable note is the Knights Of The Round Table model. This watch features an automatic, in-house caliber, but what sets its apart is the truly unique dial. This is a dial that will definitely not disappoint. Inspired by the story of King Arthur, the Knights Of The Round Table pays homage to exactly that. Each hour marker on the dial is cast in pink gold and then hand sculpted to be individual, each one representing a different knight. They are seated around a pink gold and blue table and housed inside a beautiful gold case. The watch features a striking blue alligator leather strap and buckle which ties in nicely and makes this a truly special item. This watch is an item of beauty that does not compare to any other and piece that will go down in history as unique. Limited to 28 pieces. The Velvet collection of watches are the more feminine lineup for the brand, with all models featuring precious metals and diamonds, a luxury piece indeed. Models come in yellow gold, white gold and pink gold and all feature an automatic movement. Again, a collection where price is not the object, but exclusivity. Models either come on an alligator leather strap and buckle or precious metal bracelet, with a wide range of alligator leather straps in a variety of colours. Dials also come in an array of colours including white, black and blue, but also in an exquisitely bright flower motif. Certain dial options come in an array of brilliant white diamonds encrusted throughout the entire dial, displaying ultimate luxury for those unconcerned with price, but rather the highest of status. 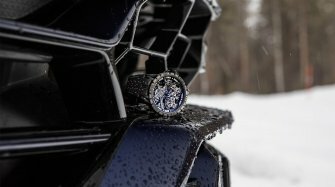 Roger Dubuis as a company and a brand have grown enormously since their humble beginnings and they certainly create a product of unparalleled luxury for the men and women who wish to turn heads.